Beware.. be present in Consumer Disputes Redressal Forum when your case calls. What to do when the complainant and counsel are absent on calling the case ? Sometime, the Court may give one more chance and if they are continuously absent, case will be dismissed in default. Then if it is in Civil Court, the party to has to file petition to restore, to set aside the exparte order. If it is in a criminal complaint, the party has to approach higher courts. But if it is a consumer court, complaint is dismissed on default for non appearance of the party and counsel, what will be next procedure available for the complainant ? Strictly speaking, only the National Commission has the power to review its own order. Neither the District Consumer disputes redressal forum nor the State Commission has the power to review its order. Then what will be plight of the complainant ? He has to rush to the National Forum for his case. This situation is really an injustice to the poor consumer clients who are thronged at the lower consumer forums. 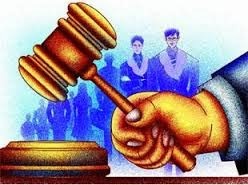 However, the full bench of High Court of Kerala held in a case reported in 2009 (1) KHC 432 that, if the order of dismissal is on default and there was no decision on merit, it can be reviewed / set aside by the lower forum it self. Though this is a face saver for poor consumer clients, there are other few decisions which asserts that only National Commission has the power to review.